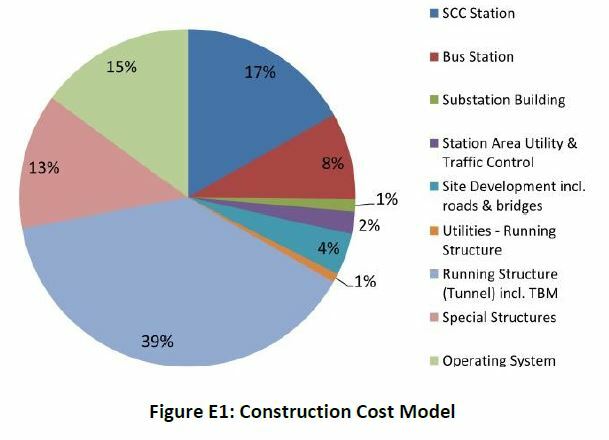 The origin of the Value Engineering Study and a related Peer Review of costs lies in a distrust at City Council that the TTC’s cost estimates for the SSE are credible given the experience of the Vaughan exension (TYSSE). 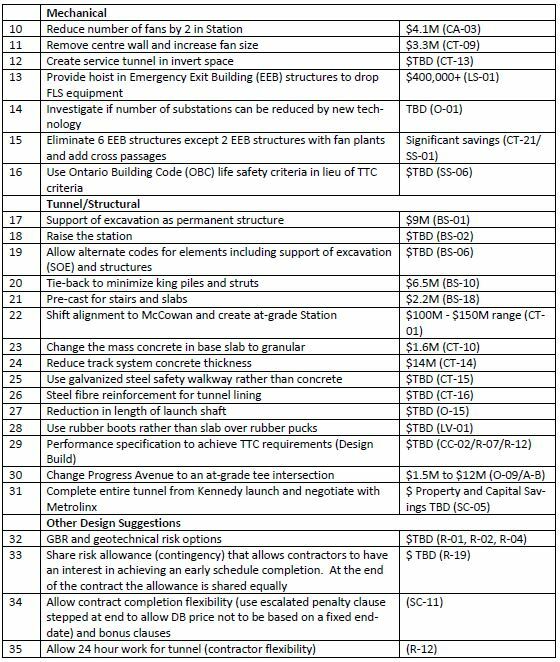 It is ironic that the TYSSE went over budget, and yet the desire for an SSE review was at least in part motivated by the idea that it could be brought in below the TTC’s projected cost. In brief, the Peer Review concludes that the TTC estimates are reasonable at the current level of design. The Value Engineering (VE) Study entailed a week-long series of meetings at which many ideas for potential cost savings were developed by a large group, then winnowed down to those with the most promise. Although a few proposals foresee cost savings of over $100 million, these options have either already been rolled into the base project design or were replaced by a more expensive alternative. SSE advocates, notably Mayor Tory, have trumpeted these potential savings as future reductions in the project estimates, but in fact they are not available for that purpose. Many of the proposals have no calculated saving, and it is unclear whether they will survive further review, and if so, would contribute substantially to reducing the overall project cost. The VE study raises many questions in cases where its proposals appear to be superseded by a more recent design for the SSE than the one the VE team considered, and in cases where some VE proposals are contradictory. I have written to the City asking for clarification on these points and have included their reply in this article. A week-long value engineering workshop was conducted in September 2016 to comb through the SSE project looking for ways to improve the design and reduce the cost. A total of 181 ideas landed on the table, of which 64 were selected as “the most likely to be implemented”. Of these, “the Team built consensus for … 35 VE Proposals for further investigation by the TTC and design team”. This statement implies that not everyone in the room agreed with all of the ideas. In any event, the TTC will continue to examine 62 of the 64. A table of the 35 proposals lists potential savings for some, but the majority are “$TBD” (to be determined). One of the major proposals, a redesign of the originally planned bus terminal, has already been incorporated in the project. This wound up costing more and the project cost estimate went up, not down, as a result. The offsetting value is that a long strip of land along the McCowan Road side of STC is opened up for development rather than being dedicated to a bus terminal. 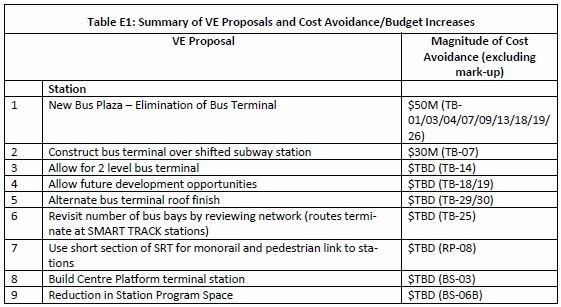 Some other proposals, notably a scheme to bring the subway above grade for the STC station, could save money, but could also undo some of the benefits of the new bus terminal by poisoning land near the station for development. Even if it were integrated with future buildings, a large elevated station would not contribute to the pedestrian orientation hoped for future developments. The other major proposals involve reductions to or changes in fire safety and ventillation provisions including the removal of most of the emergency service buildings. This would make the average and maximum distances for evacuation considerably longer, and longer distances would also affect access to the site of an incident by emergency workers. This will be a hard sell in a city that knows first hand what a subway disaster looks like. This study, although it covers a lot of ground, is not the last that will be performed on the SSE project. An important recommendation is that the process be repeated once the project reaches the 20% design stage (well before the point of final Council approval at 30%) when far more detail will be available to settle questions about the applicability of the VE proposals. It is worth understanding the breakdown of the project’s cost. Structures of various kind make up the lion’s share of the total, and it is here that the changes would have the greatest effect. The chart below is based on costs that do not include the proposed Triton Road bus terminal, and so that component of the total is understated. 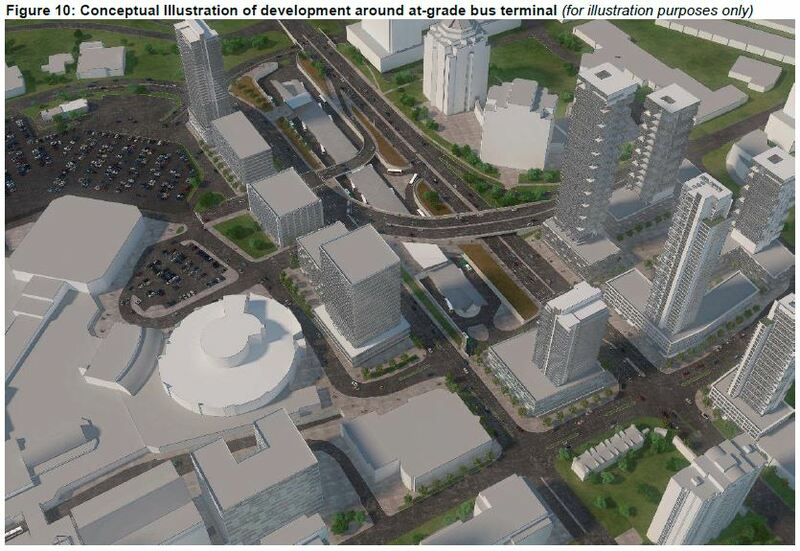 The VE team was charged with reviewing the McCowan alignment, with an at-grade bus terminal. Subsequent to the VE, Triton emerged as the preferred bus terminal location, as is better aligns with the planning values for the Scarborough Centre area. As a result, a number of the VE concepts that were specific to the at-grade bus terminal, were not suitable for further consideration. That said, the spirit of some of these VE concepts is reflected in the development of the Triton concept. It is also noted that the VE team provided something of a shopping list of concepts, some of which might overlap and hence, cannot be applied collectively. In evaluating potentially conflicting concepts, the one with the most significant benefit would be pursued. As the report notes, there is potential to carry out a subsequent value engineering exercise at a later point in design, which may identify other opportunities to optimize the project. The original bus terminal would have occupied a large space on the west side of McCowan. The illustration below shows its general layout together with a pro forma representation of future office or condo development between the terminal and the existing STC mall. The view looks northeast across the site. The terminal’s relationship to the subway station is shown below in the plan and cross-section (looking north) views. This has been replaced with the Triton Road terminal design shown below. Note the substantial additional development along McCowan where the original terminal would have been located. The plan view below shows how the new terminal design relates to the subway station. Several of the proposals relate to various locations for the bus terminal, and all seek to reduce total construction cost. All of these appear to use the long, single level terminal parallel to McCowan as their starting point. 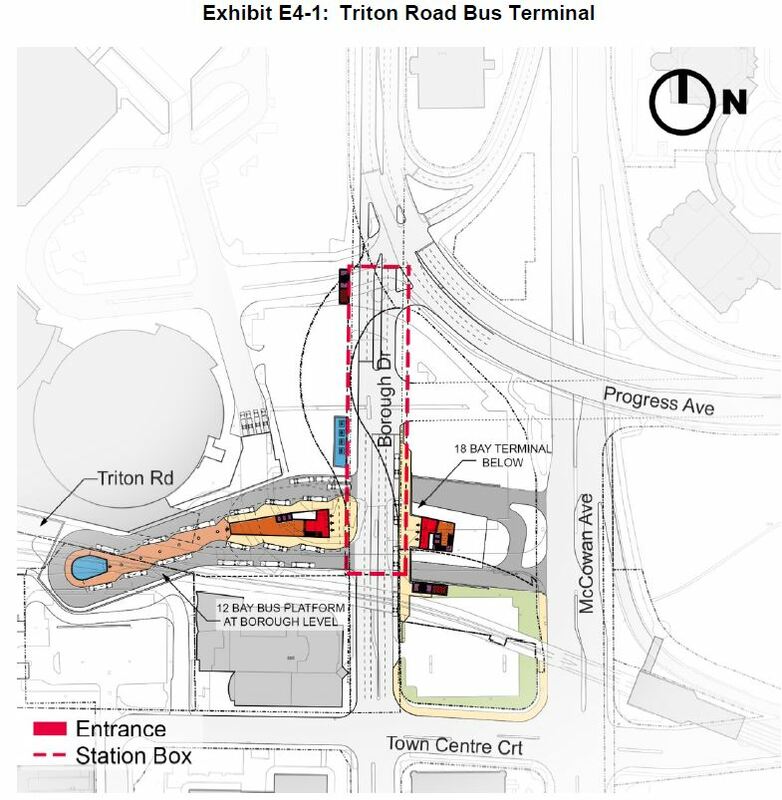 However, the proposal as put to Exec/Council is to have a stacked terminal west of the subway station in the area of Triton Road at an extra cost over the base project. This proposal appears to be substantially different from the two level bus terminal TB-14. In light of the recommended design, are any of the VE proposals related to altering the bus terminal design still even germane to the discussion? A number of the concepts related to the station location and bus terminal layout are only applicable to the at-grade bus terminal concept. These concepts were not pursued, as they did not align with the preferred Triton location. This is an important change in the context of the VE study. Mayor Tory has cited the VE study as identifying possibly a few hundred million dollars in savings. Changes to the bus terminal design would have provided a substantial chunk of that amount. Instead of saving money, the bus terminal will now be more expensive than originally planned adding about $187 million to the project’s cost. Another proposal for the terminal is that its size be reduced in recognition of sending some bus routes to SmartTrack stations rather than to STC. This is a rather odd concept considering that the terminal is intended not just as an interchange between bus routes and the subway, but within the bus network itself (including regional connections). If the assumption is that everyone arriving by bus wants to go downtown, then they could just as easily be delivered to any available GO station provided that issues of capacity and fare structure were dealt with. However, getting around within Scarborough would be a secondary consideration. A network gerrymandered to feed a rapid transit node is not, as riders in Scarborough and similar areas elsewhere in Toronto know, conducive to travel oriented elsewhere. Trips are pulled out of their way to serve the transit hub, and service patterns are oriented to downtown commuters, not to local travel. Scarborough’s GO stations (existing and future ST locations) are not located in areas with major development, and buses serving them could not do double-duty as feeders to major employment or academic centres. The VE study proposed that the layout of STC station be changed from the planned side platform arrangement to a centre platform scheme. This would simplify passenger movements because platform access would be shared for both tracks as it is at all other terminals. The station layout is shown above in the cross section view, and the alternative centre platform design below. Option BS-3 (Proposal 8) proposes an island platform at STC station in the configuration typical of subway terminals today. However, there are also descriptions that state that the location of the transition from closely spaced tracks in a single bore tunnel to the platform configuration does not allow sufficient room for the tracks to spread apart. A related problem is that with the desire to preserve Frank Faubert Woods, [and] a cut-and-cover structure that could contain this transition is limited to starting north of the woods. Which of the station layouts is the surviving one in the plan going forward? 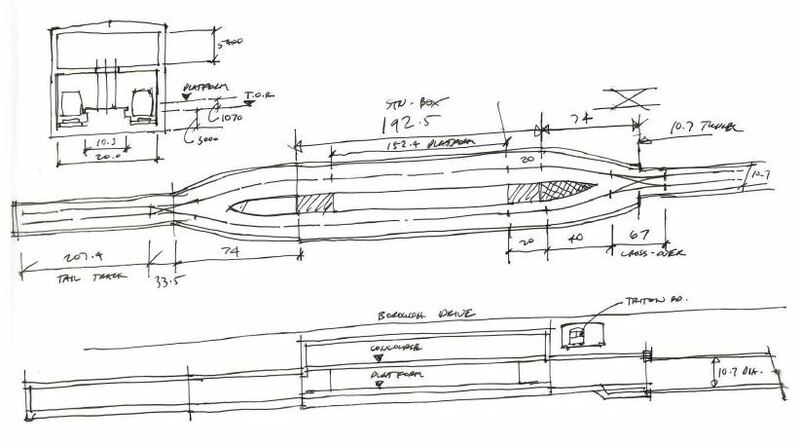 This was reviewed and confirmed that the centre platform layout requires significantly more cut and cover construction to accommodate the track spacing, to transition to a single bore tunnel. As a result, the side platform concept has been carried forward. Although a side platform station is not the typical TTC arrangement, its limitations could be addressed operationally by moving the turnaround operations north of the station so that (except when storage tracks there are in use), trains would offload on the east (northbound) platform, run into the tail track area, reverse, and load on the west (southbound) platform. In effect, this would make the terminal operate as if it were a line station at the cost of some additional turnaround time. It is unclear whether the track layout planned for STC station would permit this scheme. Also, the exact function of the tail tracks will depend on the availability of a future Kipling storage yard as discussed later in this article. One VE proposal was to shift the station to grade level to reduce the amount of excavation and thereby save considerably on the station’s cost, in the range of $100-150 million. Some of the proposals are expressly designed to avoid the need for a work shaft at Ellesmere/McCowan. This includes the proposal to shift the alignment to McCowan until a point north of Ellesmere (Option 22, CT-01) and even to have the station at grade. However, the need to avoid disruption at Ellesmere has been deleted from the plan with the current scheme for all tunnel access to occur from STC lands during construction. Within Option 22, there is a proposed saving of $100-150m. How much of this relates to the option of bringing the station to grade (something that is clearly not planned) and how much to the revised alignment? In other words, is this a “saving” that cannot possibly be achieved? Are any of these proposals still on the table? Bringing the station to grade, as suggested in this concept, was deemed not acceptable based on the impact on the surrounding area. This is another of the potential VE “savings” with a large associated value, but it is no longer under consideration. Finally, another proposal suggested that the station box be moved closer to the surface to reduce excavation costs. Option BS-02 (Proposal 18) talks of raising the elevation of the station with the result that the structure is closer to the surface of Triton Road. How does this option fit in with the proposed two-level bus terminal in the Triton Road area? Is it still viable? This concept, as described, would apply to the at-grade [bus terminal] concept. As the Triton concept has been identified as preferred, this concept is not being pursued. That said, minimizing the station depth is something that is thoroughly investigated. Creation of a barrier wall between the northbound and southbound tracks within the shared tunnel so that a fire could be contained on one track while the other, accessed via connecting fire doors, would provide an escape route. Reduction of the number of Emergency Exit Buildings (EEBs) from the planned 8 to only 2. Questions about how emergency services would reach the tunnel and evacuate passengers depending on the tunnel and EEB configuration. Questions about ventillation of the tunnel under normal and emergency conditions. EEBs are provided on the existing subway (and in the Eglinton LRT tunnel now under construction) anywhere that stations are widely spaced and the distance to an exit would be greater than is considered safe. (Similar considerations affect station design and the placement of secondary entrances.) 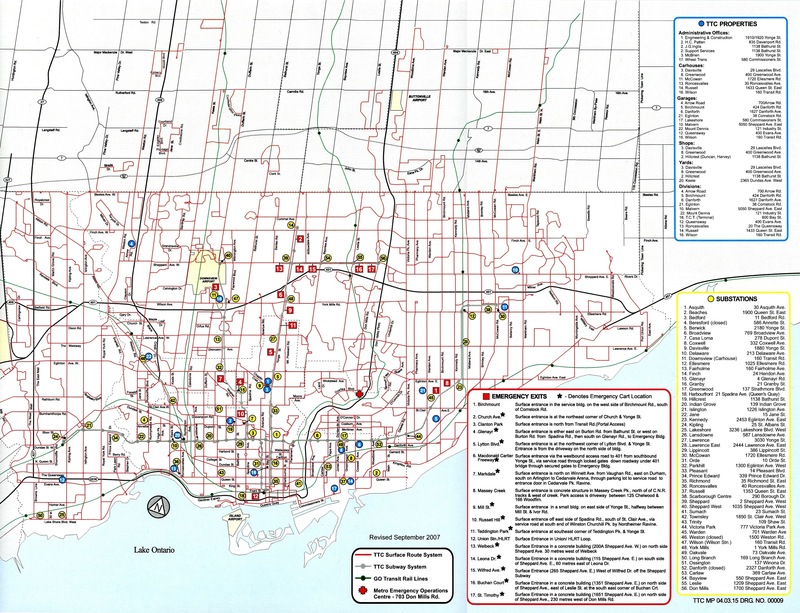 The map below shows the location of all TTC properties including emergency exits (red squares). The EEBs exist, of course, along sections of the subway with widely spaced stations, notably on the North Yonge extension (YNSE) and on Sheppard. There are two EEBs between Warden and Kennedy Stations, five between Eglinton and Finch Stations, and five on the Sheppard Subway. One of the most publicised is the Russell Hill EEB which was used to evacuate after the subway crash in 1995. The YSNE is longer at 8km than the SSE, but it also has five stations rather than one, and these provide escape points along the route. The one-stop “express” subway does not have this flexibility and therefore requires more EEBs than would be the case if there were stations at, say, Eglinton/Danforth/McCowan and at Lawrence. As a cost saving measure, the elimination of most EEBs is proposed as a matter of “Value Engineering”. The matter of tunnel access for emergency workers depends on the location and number of EEBs. One VE proposal is to add hoists at the EEBs to aid in movement of materials from the surface to tunnel level. This would be more useful with enough EEBs that the distance from the shaft to the emergency site is relatively small. Another proposal is the use of a rescue train in the “safe” alternate tunnel to move people to and from the site. This presumes that there is a train available, power to run it, and a truly safe zone through which it could operate. A related problem is that emergency workers will be trying to get in at the same time as passengers are being evacuated, and there will be conflicting demands on this train. An issue raised by the VE review is the amount of ventillation needed under both normal and emergency situations. Existing tunnels are small enough that movement of trains through them creates a familiar “piston effect” where trains push air through the system. This is especially important during hot weather as Toronto discovered during the Russell Hill disaster when temperature in the tunnel rose to a high level impeding the rescue work. With the larger diameter single tunnel proposed in Scarborough, the piston effect might not be as strong because trains will not fill the tunnel (this will be the subject of further study). In any event, during an emergency, ventillation throughout the tunnel is essential to clear smoke and to bring in fresh air. The degree to which facilities providing this can be omitted will be a matter of some debate. Any changes to existing standards for access and ventillation will require approval by the Fire Department. Various proposals relate to the configuration of the tunnel including emergency exits, ventilation, etc. There is a direct conflict between proposals for tunnel designs which isolate the northbound and southbound spaces with a central wall, and proposals that foresee a single shared space as a way to save money on that wall. These are inconsistent. Which version is being recommended/included in the design? Review of the centre wall/no centre wall concepts is ongoing and touches on many aspects of the tunnel design. Ultimately, the most beneficial scenario will be pursued. With respect to evacuation from the tunnel, there are references to problems with having more than one train (one of which could be the source of fire) in the same section of the tunnel thereby compromising rescue efforts for another train or trains. This is related both to the presence/absence of the central wall, the number and location of the Emergency Exit Buildings, the ability to manage air flow and the possibility/probability of train locations. As you have recognized, there are many aspects that must be considered in developing the best solution. As noted in response to [the previous] question, this evaluation is ongoing. The authors do not appear to have considered that with ATC, trains can become very closely spaced, especially when one of them is disabled, and there is no guarantee that the problem of multiple trains in a fire zone could well happen as a matter of normal operations. This is notably caused by queueing that typically occurs on approaches to terminals, but could also occur if one train stopped, and its follower was brought in close behind as a normal part of ATC operation before an alarm was raised to prevent this. Are there any comments on this set of problems and how reasonable it is to assume that trains could be isolated from each other as supposed? Further to the previous response, the operation of trains under ATC is also considered and the functionality will be designed to ensure future ATC implementation will operate safely. Quite bluntly, that is a non-answer that does not recognize the fact that emergencies do not occur under carefully controlled circumstances, and that normal system operation (including trains creeping up to each other) will continue for some time between the onset of an emergency and the decision that “something must be done”. If the signal system is designed to keep trains apart as a matter of fire spacing, this will directly contradict the avowed purpose of ATC which is to allow trains to run closer together. One cannot help feeling that there is a sense of wishful thinking that affects some of these proposals. Several proposals relate to the standards for structure of stations and tunnels as they would affect size, thickness and the amount of material used. Clearly there is a discrepancy between the standards some participants in the VE session thought could be used and those that are standards for TTC construction. Clarification of which standards are appropriate should occur as soon as possible, but in any event it is worth noting that the dollar savings associated with these are small compared to the overall project. The issue is whether a structure built to last 100 years underground requires a different standard from a building on the surface, and whether the cost difference is one of excessive cautiousness by the TTC, or if different standards really should apply. One item that was noted was the track slab system which is proposed to be similar to that used on the Spadina subway and extension. This is a “floating slab” where the track is mounted to large concrete pads that, in turn, sit on large rubber “pucks” that provide vibration isolation to the tunnel structure and earth beyond. By contrast, the subway tunnels built before Spadina have the rail mounted directly on the concrete tunnel floor. The VE team proposes that the track be laid in a rubber boot to avoid the need for the extra layer of the floating slap. A variation on this scheme was recently installed between Keele and High Park Stations as a test of vibration reduction. It is specifically designed both for retrofits to existing tunnels (avoiding changing the rail height that could cause clearance problems) and for new construction (to eliminate the need for a floating slab). As noted in one of the questions above, a number of VE proposals involved shifting the tunnel alignment and/or launch sites to reduce or eliminate the effect of work at Ellesmere as in the original proposal. With the currently proposed design, the launch site has moved to the northeast part of STC, and disruption at Ellesmere is no longer an issue. The study foresees the acquisition of additional T-1 trains for the extension, but in fact a new fleet for Line 2 including ATC will be required as the extension will (like the TYSSE) be built for ATC, not for manual operation. The TTC recently acquired property for a new subway yard near Kipling Station and a carhouse/shops that will be designed for 6-car trainsets like those used on Line 1 YUS. The existence of this property could reduce storage requirements for trains at the east end of the SSE, and this should be factored into the design at STC station. The risk analysis work performed to date is of high quality and illustrates a level of detail beyond what would be expected given the stage of project of development. It presents a logical and well thought out process which will establish a solid foundation as the project advances. Risk management has become a big issue for the TTC and the City after the cost overruns for the TYSSE project. There is always a balancing act between allowances for problems that might occur with their associated effects on cost and project schedule, and the degree to which these can be limited, or at least reasonably provided for up front. A common complaint when Council reviews capital budgets is the large contingency built into project estimates. When a third of a $3.5 billion estimate is “contingency”, the amateur accountants spring up with their sharp pencils and green eyeshades in the hope of saving money, of getting more subway for less. This can be very counterproductive especially when a project is in the early stages of design. However, City budget procedures require that the full cost of a project be committed when the project is approved, and this “approval” can come far sooner than the actual costs can be nailed down. Recently, the City has adopted a staged approval procedure so that the final go/nogo decision occurs at a point where the potential costs and schedule are better understood. This plays against the political imperative to announce early (and often) and to lock in projects even though they are poorly understood beyond a line on a map. One pool would be for truly risk-related costs such as unforeseen conditions that drive up construction complexity or extend timelines. The other would be a “management reserve” primarily intended to address scope creep where elements are added to a project after it is approved. The separation of these pools also allows separation of authority for spending from them. The management reserve could only be used if approval at a senior level, probably including some political representation, were obtained. Moreover, the risk pool would not simply exist as a “slush fund”, but would be allocated to specific risks. When the risk was eliminated (for example by completion of some part of the project) or substantially reduced, related monies would shift to the management reserve. This would prevent the situation that occurred on the TYSSE where extra costs such as those associated with station architecture (and construction bids well above estimates) were covered from the contingency, leaving no money to pay for real risks such as construction delays. This also brings the “on time, on budget” issue more into the open because monies cannot be shifted around as easily to cover problems. However, where there is a political will to pretend that all is well, as was certainly the case for the TYSSE, there will be a need for transparency in project reporting to prevent last minute surprises. Among the risk management proposals are those related to some acceptance of risk by the project builders through a public-private partnership, or some equivalent. This will involve tradeoffs between the cost of the public sector carrying the risk and the extra cost of putting this on the private sector where it is assumed there is an incentive to control such costs. The jury is out on how effective this will be because there are so few projects to use as comparators. As the design process proceeds to the 30% level where Council is expected to make its final decision (likely late in 2018), some risks will be reduced or eliminated, and the provision for risk will probably come down. This does not mean that the project price will fall, only that the potential for variation will be reduced through greater certainty of what will be built. Funny, the biggest cost savings are from NOT doing something less-wise to stupid right? And the silence on that option is pretty stunning, and those who wish to squeeze the billions get attacked and maligned for being anti-subway etc. Yet former CGM of the TTC Michael Warren just called this Suspect Subway Extension “The worst transit boondoggle in the city’s history..”. This is the reason why we should of used a guideway. On a guideway, even if a fire is to break out, smoke and people can escape without costly emergency exits and ventilation shafts. By the time the Scarborough extension opens, the T35A08 might not be so modern any more. The next gen Movia metro cars will have a lower wayside noise profile due to aero skirts and wind tunnel shaping. Even if it is operated in open air, houses near it will be subjected to noise less than a passing motor coach. There should be less concern about fire given better monitoring systems. Monitoring systems can communicate two ways so HQ will always know the health of the trainsets. For example, oxygen sensors can detect a drop in oxygen level indicate a possible fire. There is no need for an engineer to visually confirm the presence of a fire and then radio HQ. We have the technology to do great things and not fight the last war. The extension will be built one way or the other especially given the provincial election will happen next year. We just need to be sensible with spending the money. As for servicing the Smart Track stations, we just need to add an extra stop to the 190 bus. The bus is already there. On a side note, Smart Track and TTC should not be looked as competing service. A lot of the Smart Track customers might be heading north to connect to Viva Blue at Unionville GO. 15 minutes service is much better than 30 minutes service for the 129A. Once the zoning changes around the Smart Track stations, there will be more walk in traffic. Look at Miliken GO station, Pacific Mall and Market Village (Remington Center) is within walking distance. That is a major attraction. Those malls will also have on site condo towers in the future. Never mind a fire in the tunnels, what happens when (not if) there’s some kind of incident on the line that halts operation for a while? With closely spaced stations, such as on most of the Bloor-Danforth, trains can proceed to the next station and hold. This gives passengers the option of getting off the train. If however an incident happened at STC station, there will surely be one or two trains in the tunnel beyond Kennedy. Those passengers will be stuck. It is unreasonable to expect actual evacuation, so if you’re on that train, you’ll be sitting there for a while. This has happened to passengers on GO trains, who were not allowed to leave the coaches onto the ROW when a level-crossing incident happened further up the line. It could be three or four hours….now imagine being on a subway car in a tunnel (and with potential power-off, so emergency lights only), rather than on an above-ground GO train with hotelling power provided by the locomotive. Of course this scenario is still possible on the existing system, most notably if there’s an incident at Kennedy or Downsview stations. 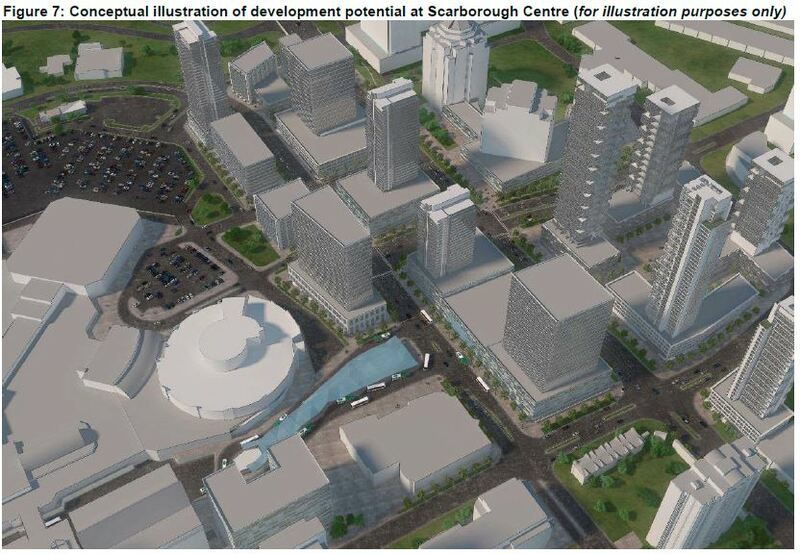 Why anyone would want to enable a bonus giant-sized version of this scenario in Scarborough escapes me. Steve: There are two EEBs between Kennedy and Warden, one just west of Kennedy and the other at Birchmount. In a VE study, the first question to ask is: “what is the purpose”. The answer is to connect SRT to Downtown without transfer. I am sure many experts could have found better, less expensive solutions to this. It appears the question They did ask was: “can we shave a few dollars on a route that is set in stone”. They likely had no chance of accomplishing anything meaningful. 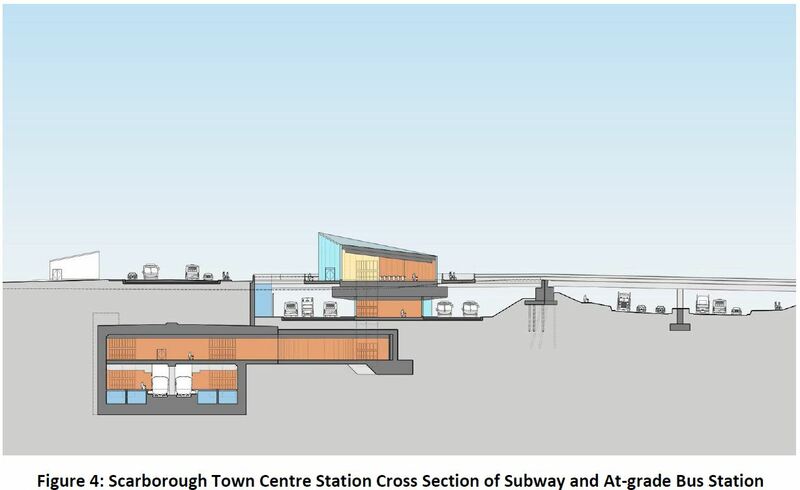 The diagrams regarding the STC station are intended to residents of Scarborough. The STC is served by 4 roads, Brimley, Ellesmere, McCowan and Progress. Three days before Christmas these roads are packed/blocked. How they will ever get the 40+ bus routes to access STC defies reason. 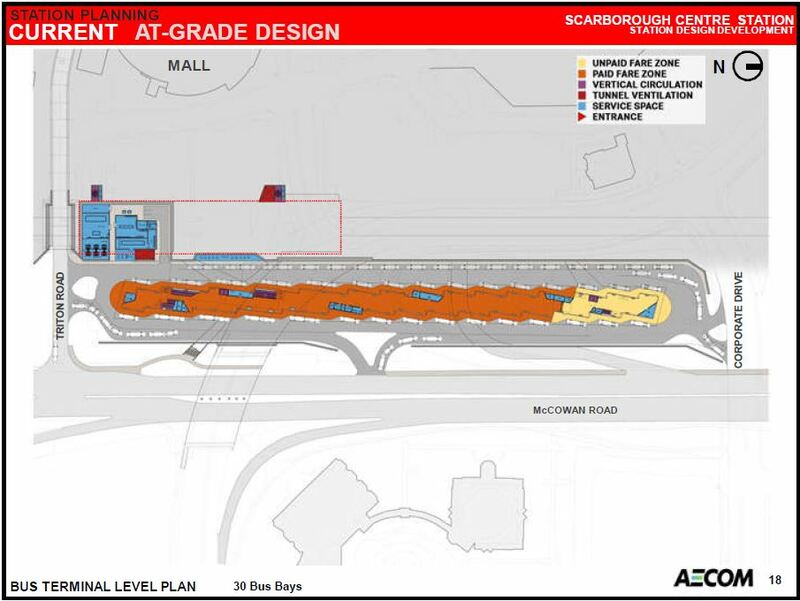 Bill R: The diagrams regarding the STC station are intended to residents of Scarborough. The STC is served by 4 roads, Brimley, Ellesmere, McCowan and Progress. Three days before Christmas these roads are packed/blocked. How they will ever get the 40+ bus routes to access STC defies reason. Have you heard of underground transit? The buses will preferably be underground as in the gold plated Forest Hill area (Eglinton station). Steve: There is no underground bus station anywhere along the Eglinton line. Your attempt at class warfare is ill-informed. However, the station at STC will be partly underground and will include a dedicated access from McCowan. It is one of the reasons that when you balance the reasonably structure of transit, it makes more sense to work to get more rapid transit at a lower capacity. There are too many trips made, too far in traffic. The current plan also ignores the huge barrier that is the 401 in terms of linking the transit in the area. The current STC focused plan seems to be political pandering at its worst. Proposal 7 caught my attention. By monorail, are they suggesting a people mover system for the SRT campus to address the last-mile issue? Steve: Only for the extent of the existing structure. Frankly I think it’s a non-starter considering how spread out existing and potential development will be east of McCowan. If you look at the detail in the report, you will see that it’s an automated minibus, not a fixed guideway people mover. Of course if they wanted better distribution, they could always have built the LRT. Until they were whipped into line, City Planning favoured the east-west alignment of the LRT because it better served the STC planning district which is an east-west rectangle. Some of those proposals to cut costs are amounting to compromising healthy and safety (reducing the number of fans, etc) which won’t be tolerated in any Downtown facilities. If we are going to build a subway in Scarborough (which we should), then let’s not compromise on health and safety just to save a buck here and there. Although it’s probably just wishful thinking, I’m now interested in seeing a comparison of the SSE vs. a fully-automated express SRT between Kennedy and STC. Although the SRT will require a transfer at Kennedy, they say that only every second subway train will go to STC. So with the subway, you have a 50% chance of having to wait 5-7 minutes to get the right train. With an automated SRT that provides, say, frequent 2 minute service, the transfer will probably be 3 minutes or so. So performance-wise, they might be similar. Cost-wise, an upgraded express SRT will probably be billions cheaper. The saved money could be used minimize the down-time of the SRT during the upgrade or to double-track the RER in the area or to extend the SRT to Centennial or as a down-payment on a subway extension to Lawrence or something. It’ll be weird if we end up spending an extra $2bn in order to save people 30 seconds. Your point Steve, re: EEBs is immaterial; regular delays will never be cause for evacuation. Steve: Two points here. Actually, trains have been evacuated albeit rarely. My issue was that there will be a delay between the point at which a train with a fire stops, and service approaching the fire is halted. With existing signals, the following train would automatically be held back two blocks, but with ATC, the following train may be brought up quite close to the stopped one. This will make the fire scene more crowded and potentially involve more than one train in the emergency. There is also the issue of the location of ventillation shafts and fans. I think the folks proposing fewer EEBs and a reduction of ventillation have not thought through the real-world operating environment. This combined with gerrymandering (32 ???) buses to leave their service areas to serve the subway guarantees REGULAR commuter chaos in Scarborough. Lastly, Another Joe, Eglinton/Yonge is not Forest Hill. The bus bay is hidden behind a shopping centre/office building, and is not below ground. They will wish they had extended the SRT and developed transit city. Put the subway stop in at Lawrence and that will make bus trips MUCH shorter for the many people who take the Lawrence 54 buses. It sounds like SmartTrack is getting yet another look, and the people now stuck on a truly horrible bus will be left out of rapid transit.